kh. 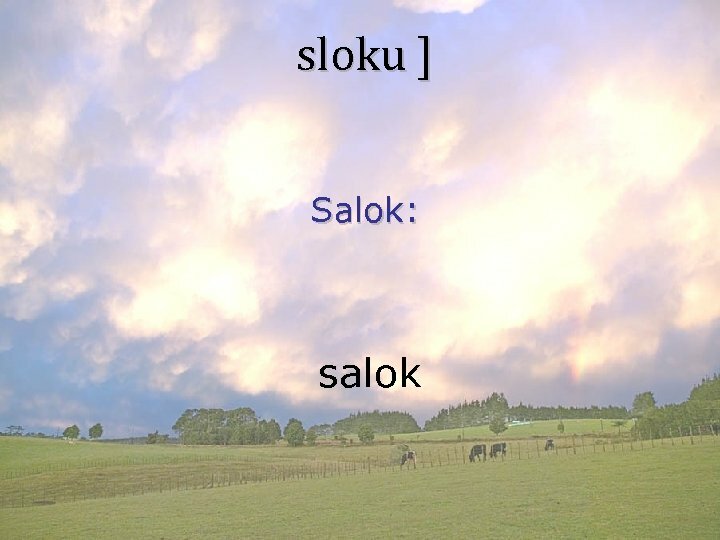 Y nwnku Anµdu ho. Aw siqgur. U m. Y pwie. 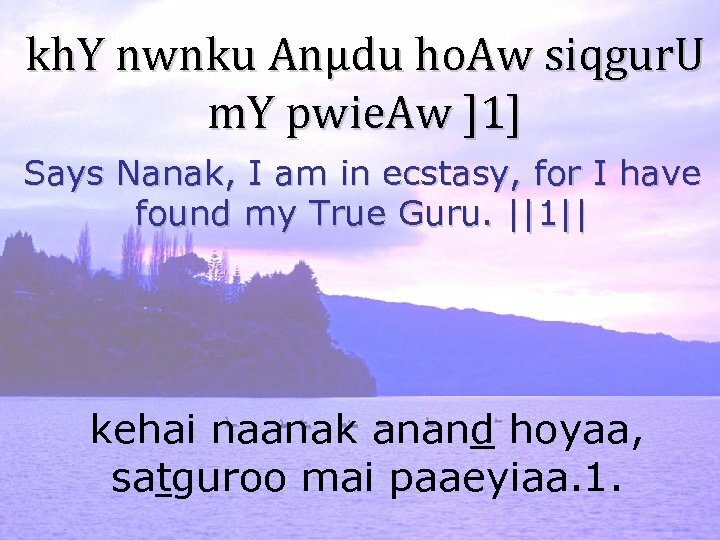 Aw ]1] Says Nanak, I am in ecstasy, for I have found my True Guru. ||1|| kehai naanak anand hoyaa, satguroo mai paaeyiaa. 1.
kh. 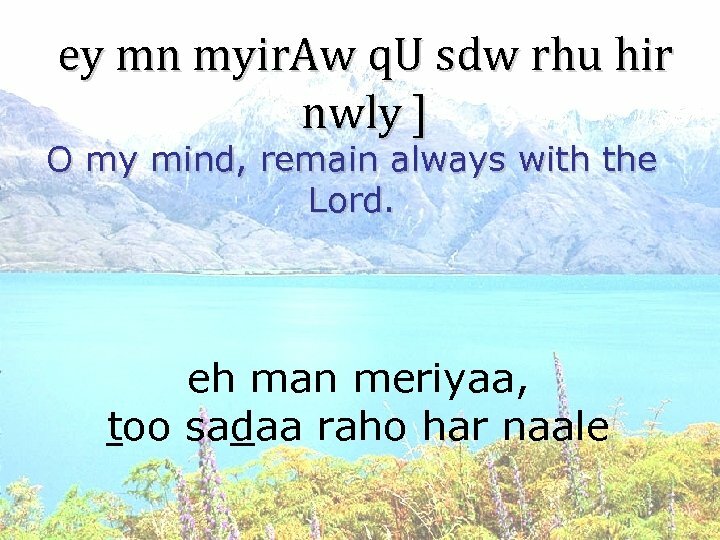 Y nwnku m. Mn myry sdw rhu hir nwly ]2] Says Nanak, O my mind, remain always with the Lord. ||2|| kehai naanak mann mere, sadaa raho har naale. 2.
kh. 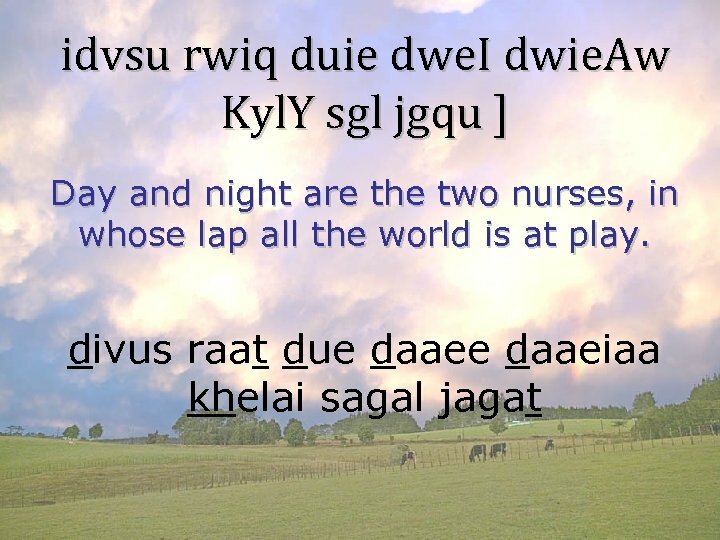 Y nwnku scy swihb ik. Aw nwh. I Gir qyr. 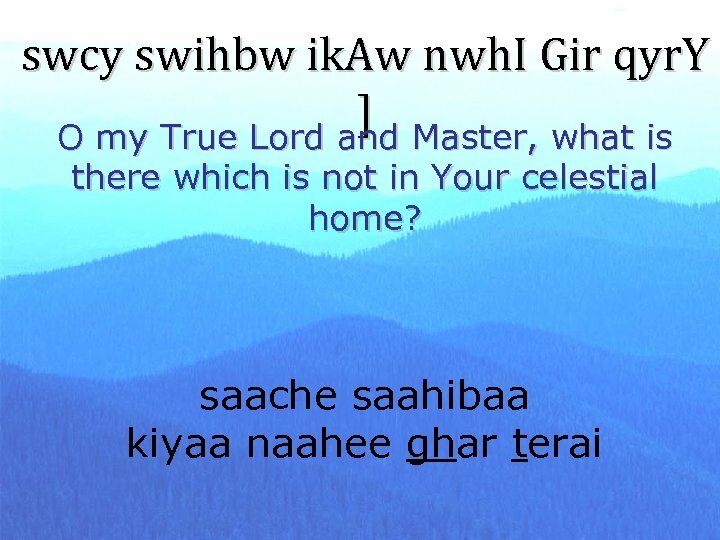 Y ]3] Says Nanak, O my True Lord and Master, what is there which is not in Your home? ||3|| kehai naanak sache saahib, kiyaa naahee ghar terai. 3.
swcw nwmu myrw Aw. 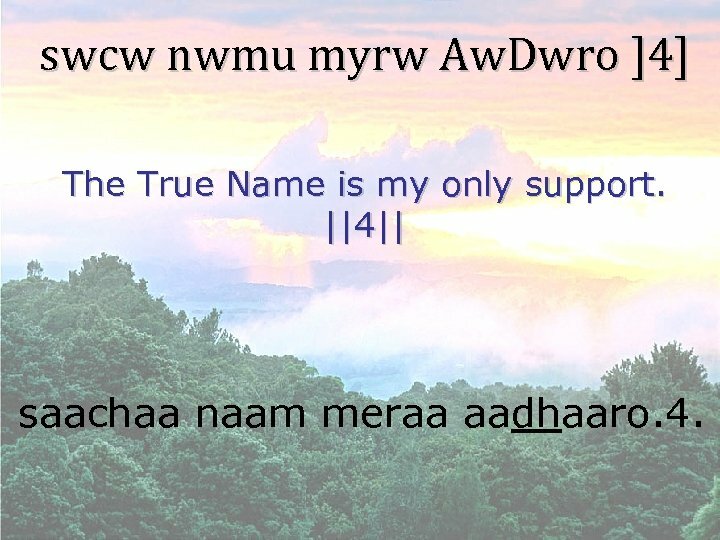 Dwro ]4] The True Name is my only support. ||4|| saachaa naam meraa aadhaaro. 4.
kh. Y nwnku qh su. Ku ho. 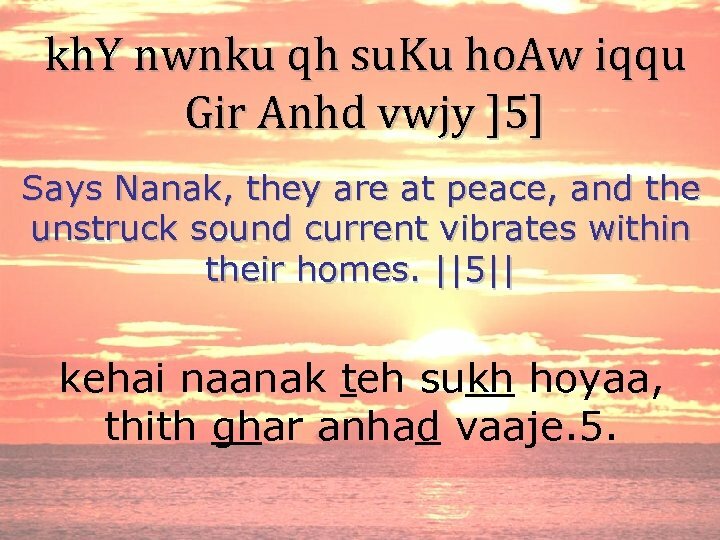 Aw iqqu Gir Anhd vwjy ]5] Says Nanak, they are at peace, and the unstruck sound current vibrates within their homes. ||5|| kehai naanak teh sukh hoyaa, thith ghar anhad vaaje. 5.
ibnv. 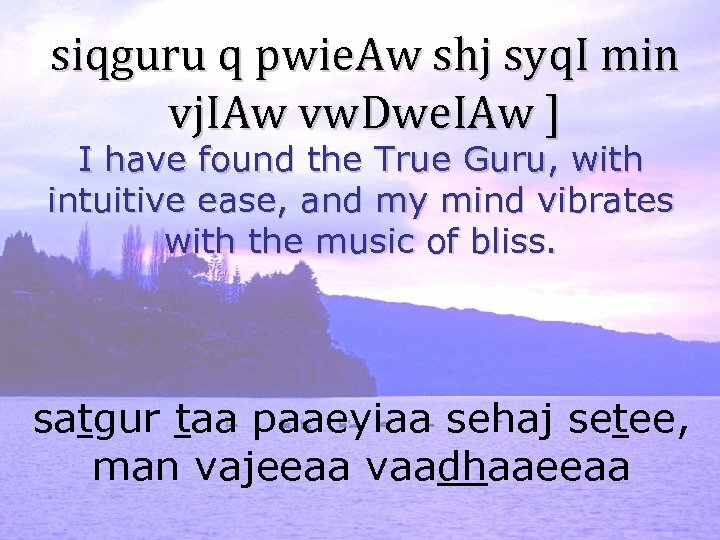 Miq nwnku gur crx lwgy vwjy Anhd q. Ury ]40]1] Prays Nanak, touching the Guru's Feet, the unstruck sound current of the celestial bugles vibrates and resounds. ||40||1|| binvant naanak gur charan laage vaaje anhad toore. 40. 1.
nwnk qy mu. K aujly kyq. I Cut. 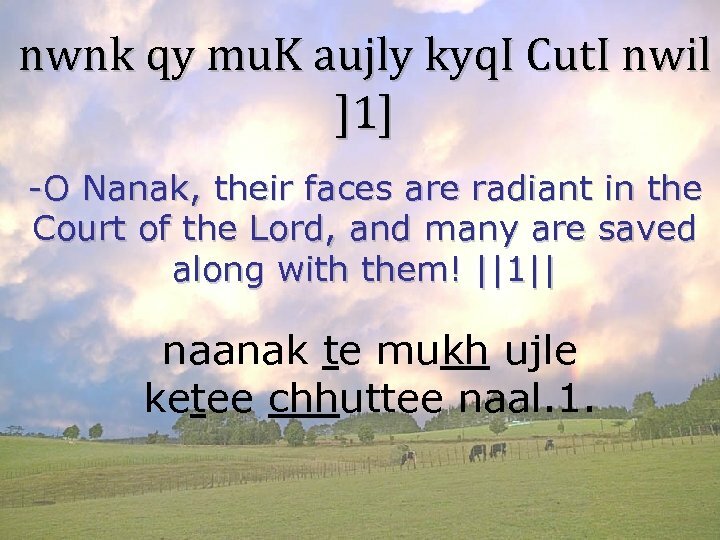 I nwil ]1] -O Nanak, their faces are radiant in the Court of the Lord, and many are saved along with them! ||1|| naanak te mukh ujle ketee chhuttee naal. 1. There is one God. All Victory belongs to God. 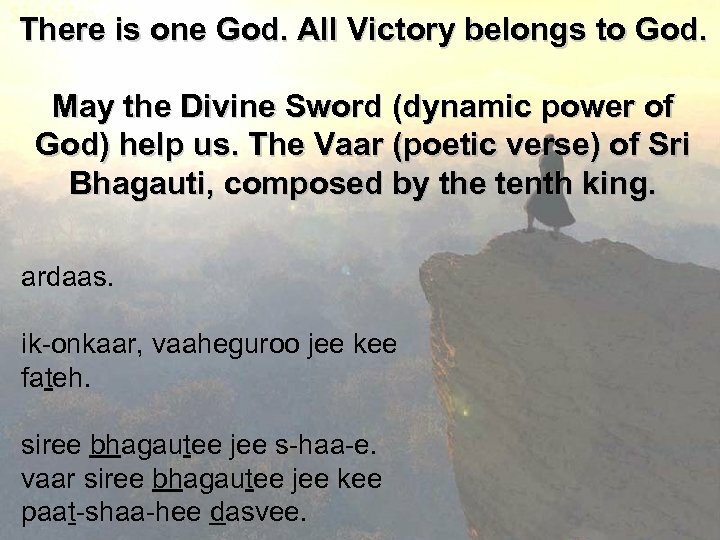 May the Divine Sword (dynamic power of God) help us. 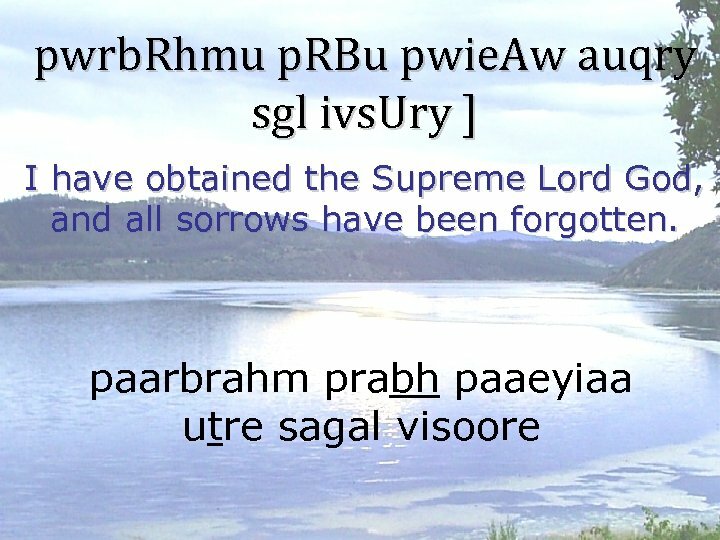 The Vaar (poetic verse) of Sri Bhagauti, composed by the tenth king. ardaas. ik-onkaar, vaaheguroo jee kee fateh. 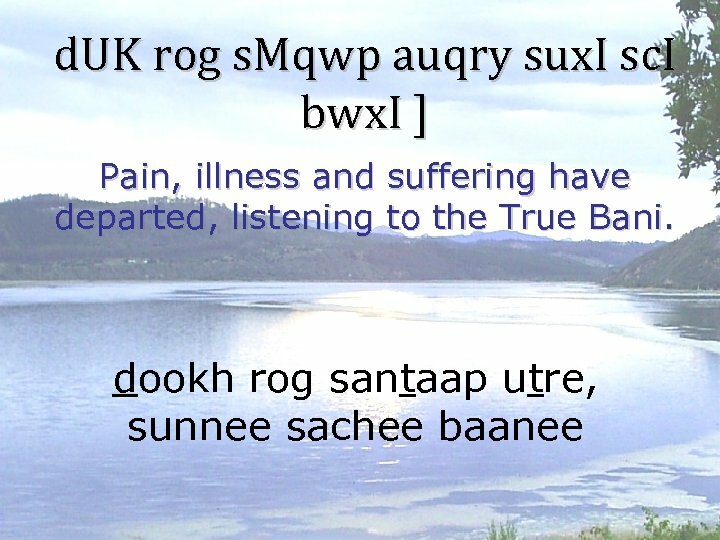 siree bhagautee jee s-haa-e. vaar siree bhagautee jee kee paat-shaa-hee dasvee. 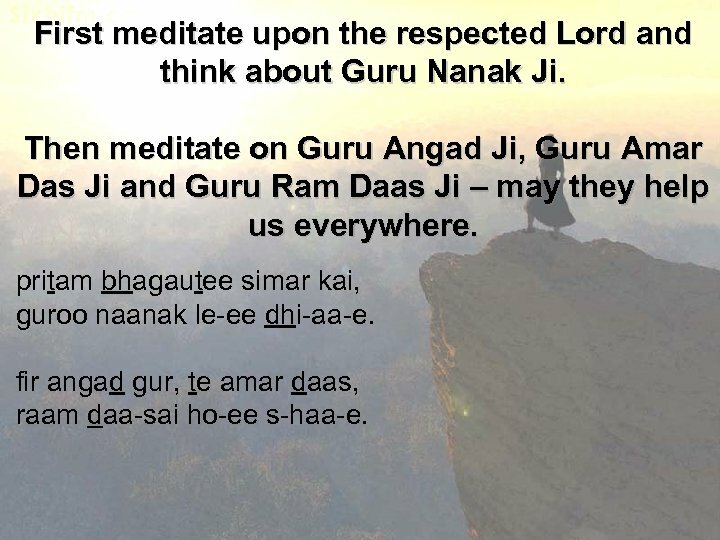 First meditate upon the respected Lord and think about Guru Nanak Ji. 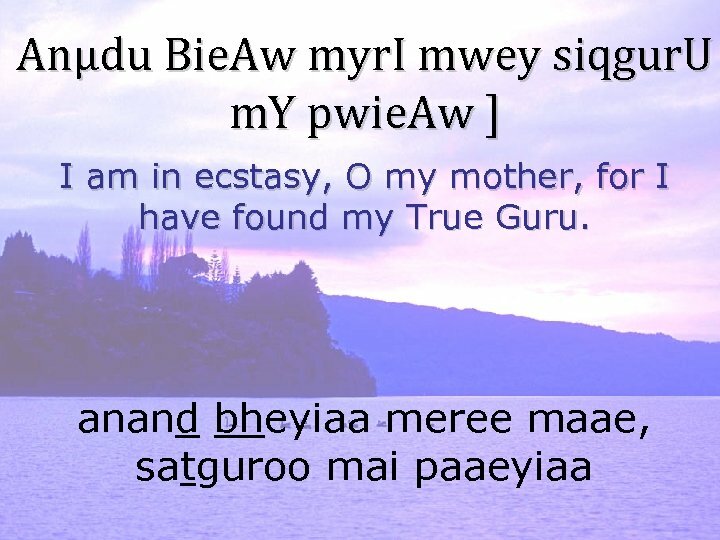 Then meditate on Guru Angad Ji, Guru Amar Das Ji and Guru Ram Daas Ji – may they help us everywhere. 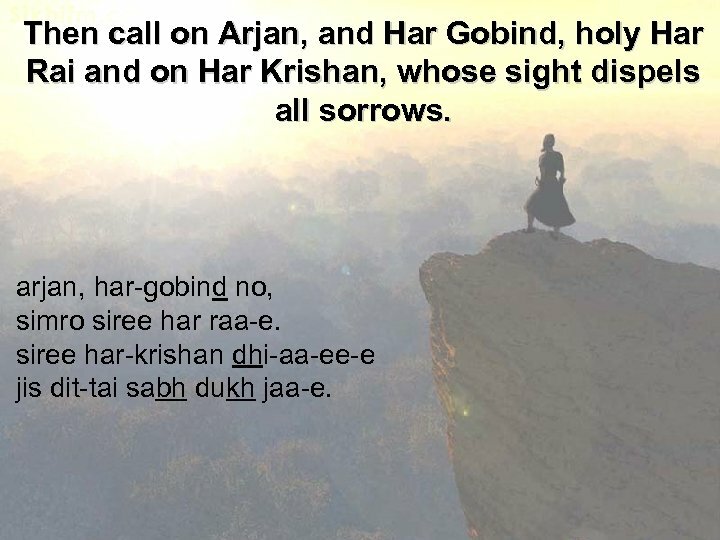 pritam bhagautee simar kai, guroo naanak le-ee dhi-aa-e. fir angad gur, te amar daas, raam daa-sai ho-ee s-haa-e.
Then call on Arjan, and Har Gobind, holy Har Rai and on Har Krishan, whose sight dispels all sorrows. 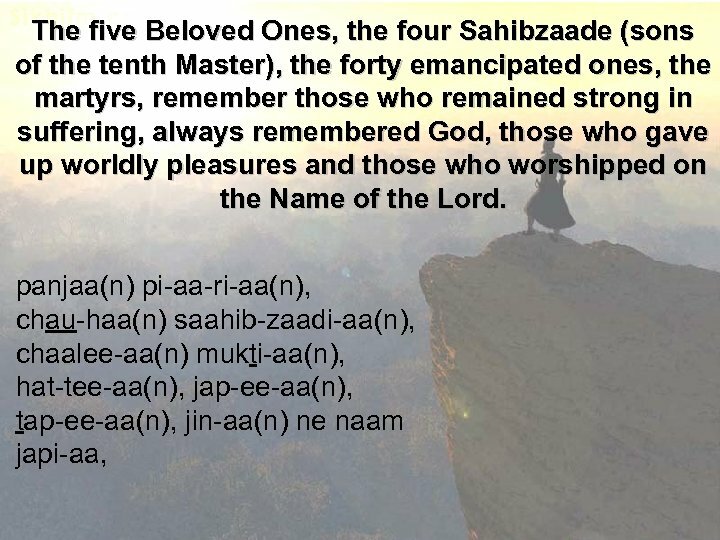 arjan, har-gobind no, simro siree har raa-e. siree har-krishan dhi-aa-ee-e jis dit-tai sabh dukh jaa-e.
Then remember Teg Bahadur by whose remembrance the nine treasures come hurrying to ones home. 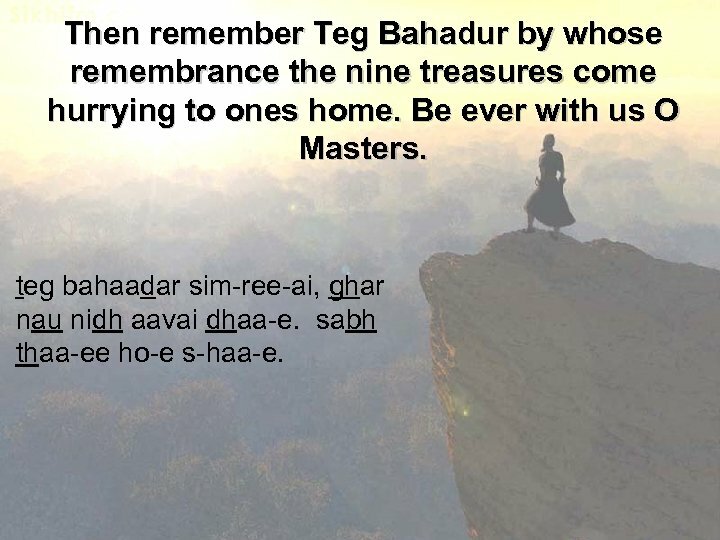 Be ever with us O Masters. 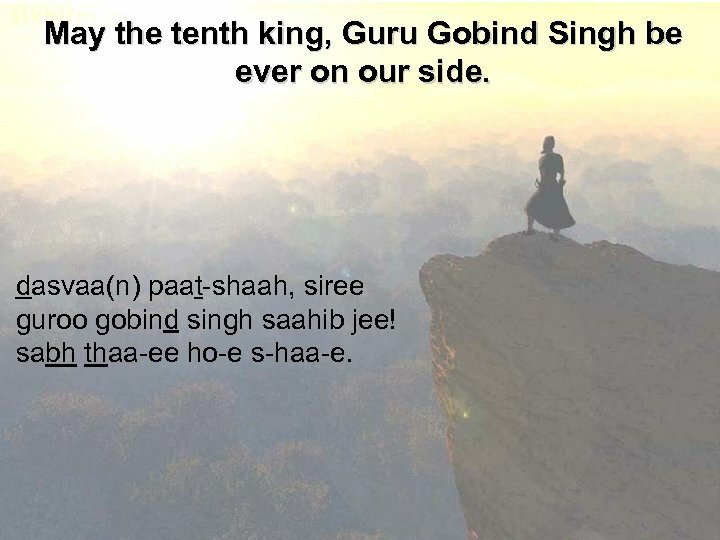 teg bahaadar sim-ree-ai, ghar nau nidh aavai dhaa-e. sabh thaa-ee ho-e s-haa-e.
May the tenth king, Guru Gobind Singh be ever on our side. 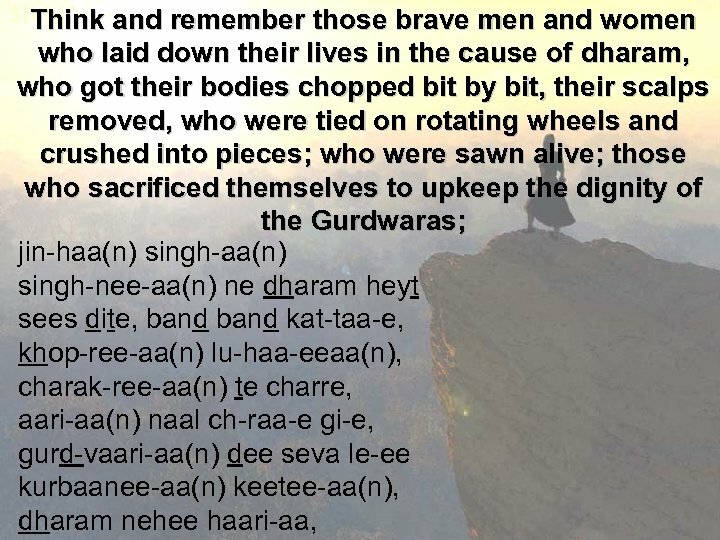 dasvaa(n) paat-shaah, siree guroo gobind singh saahib jee! 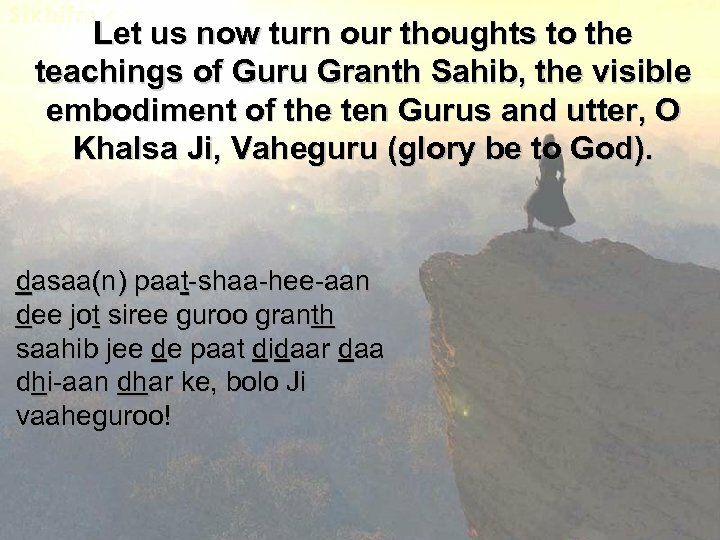 sabh thaa-ee ho-e s-haa-e.
Let us now turn our thoughts to the teachings of Guru Granth Sahib, the visible embodiment of the ten Gurus and utter, O Khalsa Ji, Vaheguru (glory be to God). 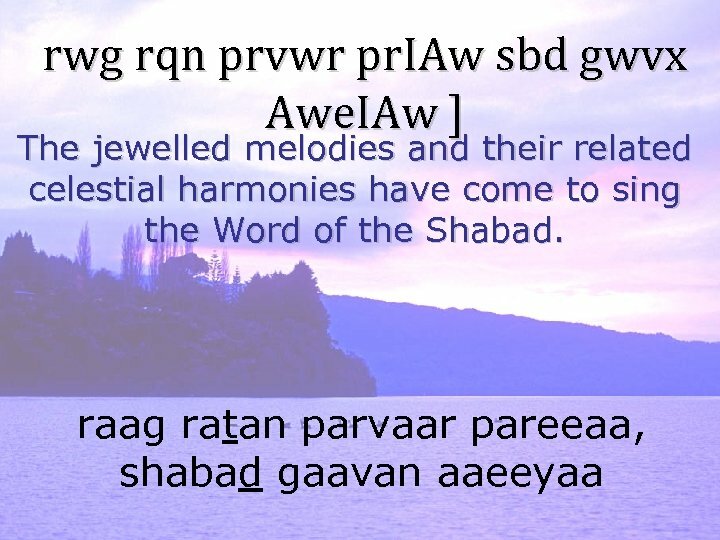 dasaa(n) paat-shaa-hee-aan dee jot siree guroo granth saahib jee de paat didaar daa dhi-aan dhar ke, bolo Ji vaaheguroo! Those who shared food with others, fed the hungry, protected the weak with sword, and saw other’s faults but overlooked them. 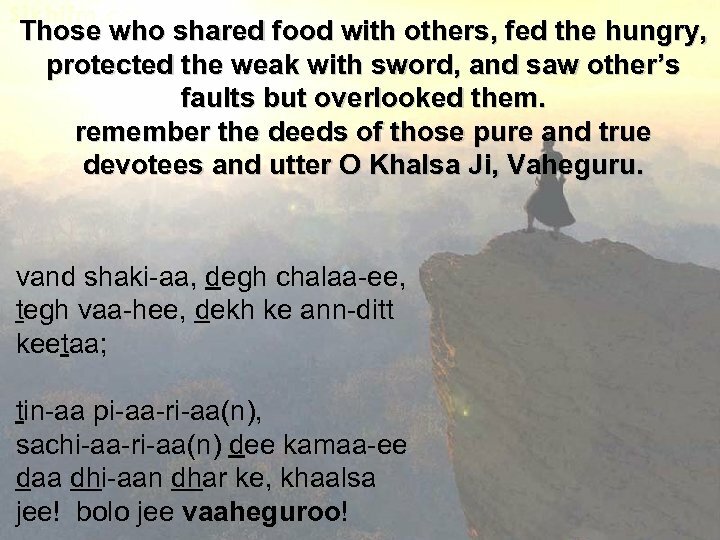 remember the deeds of those pure and true devotees and utter O Khalsa Ji, Vaheguru. vand shaki-aa, degh chalaa-ee, tegh vaa-hee, dekh ke ann-ditt keetaa; tin-aa pi-aa-ri-aa(n), sachi-aa-ri-aa(n) dee kamaa-ee daa dhi-aan dhar ke, khaalsa jee! bolo jee vaaheguroo! 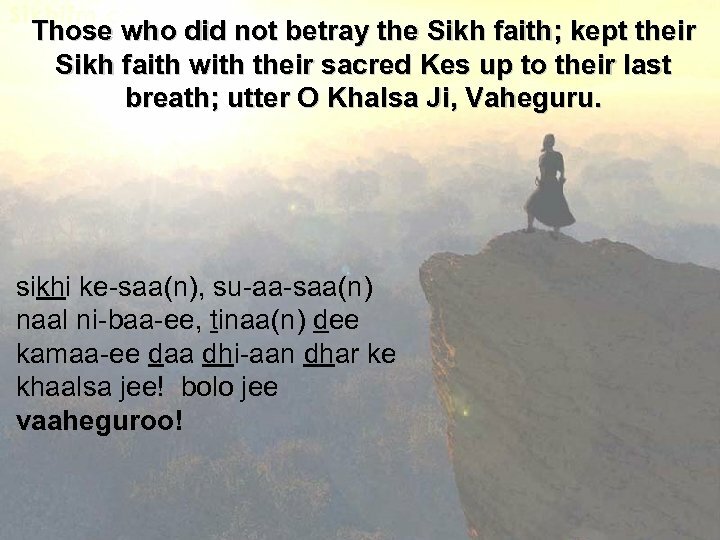 Those who did not betray the Sikh faith; kept their Sikh faith with their sacred Kes up to their last breath; utter O Khalsa Ji, Vaheguru. 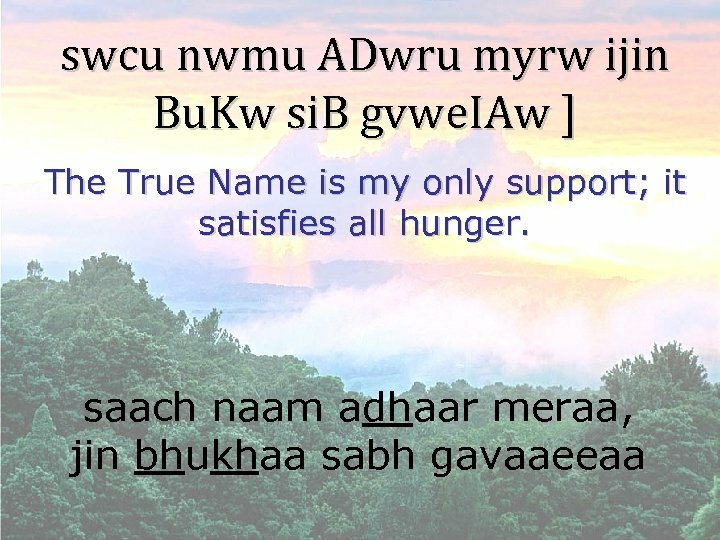 sikhi ke-saa(n), su-aa-saa(n) naal ni-baa-ee, tinaa(n) dee kamaa-ee daa dhi-aan dhar ke khaalsa jee! bolo jee vaaheguroo! 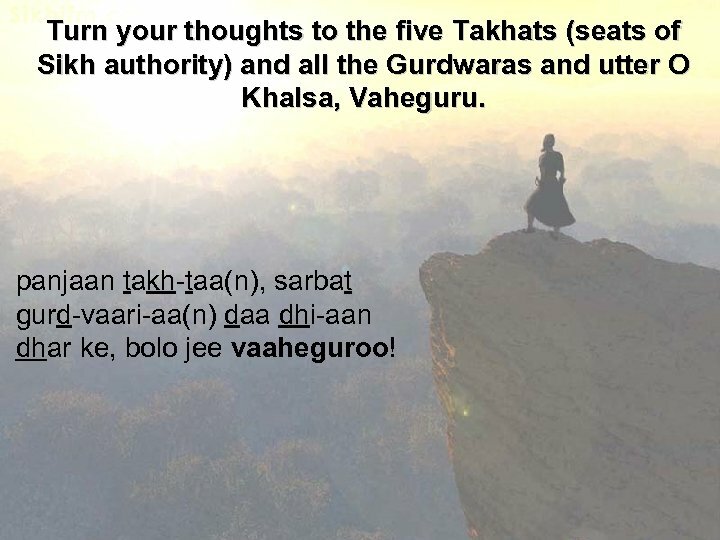 Turn your thoughts to the five Takhats (seats of Sikh authority) and all the Gurdwaras and utter O Khalsa, Vaheguru. 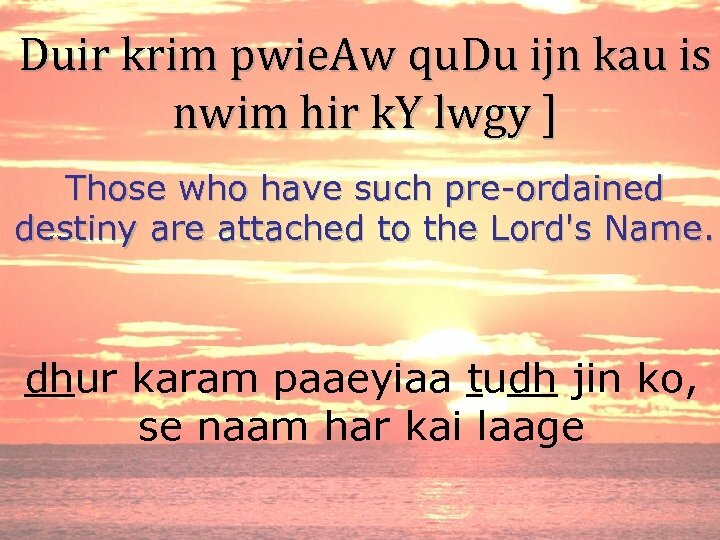 panjaan takh-taa(n), sarbat gurd-vaari-aa(n) daa dhi-aan dhar ke, bolo jee vaaheguroo! 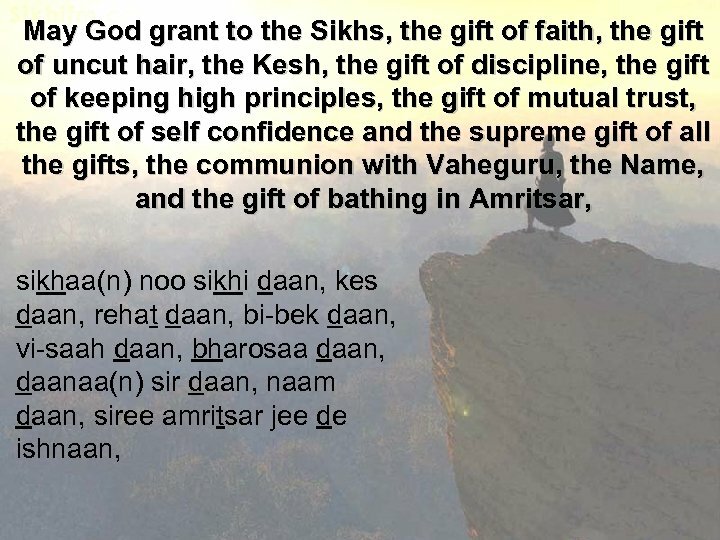 First, there is supplication for all the Khalsa Panth. 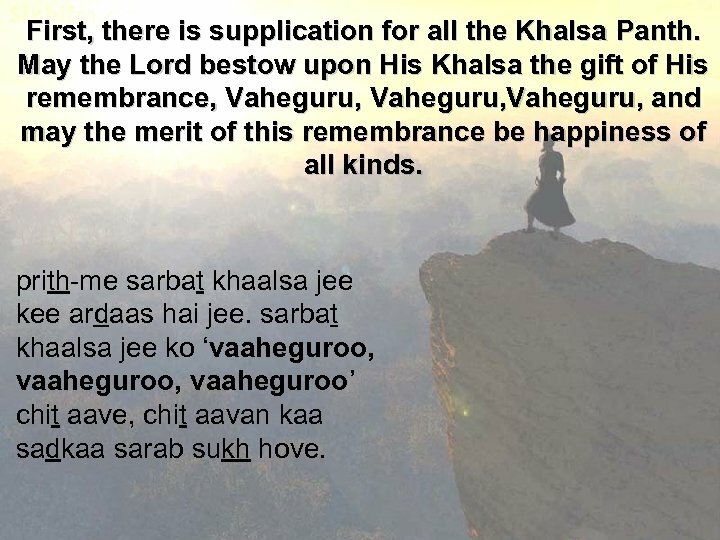 May the Lord bestow upon His Khalsa the gift of His remembrance, Vaheguru, and may the merit of this remembrance be happiness of all kinds. prith-me sarbat khaalsa jee kee ardaas hai jee. 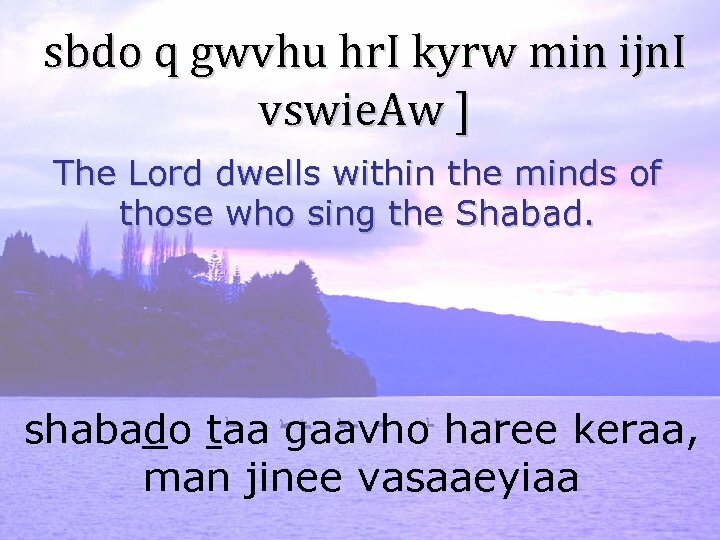 sarbat khaalsa jee ko ‘vaaheguroo, vaaheguroo’ chit aave, chit aavan kaa sadkaa sarab sukh hove. 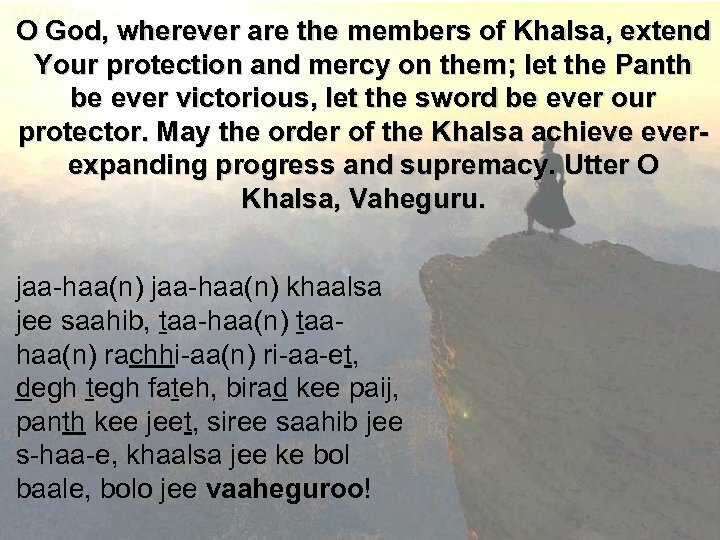 O God, wherever are the members of Khalsa, extend Your protection and mercy on them; let the Panth be ever victorious, let the sword be ever our protector. May the order of the Khalsa achieve everexpanding progress and supremacy. 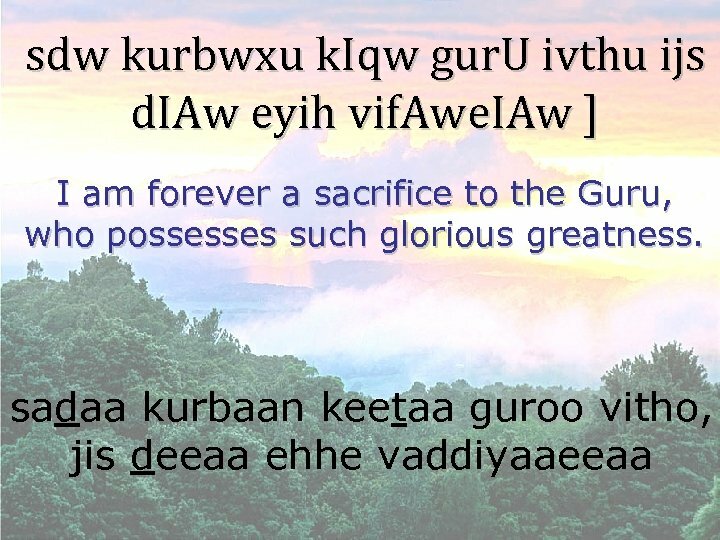 Utter O Khalsa, Vaheguru. 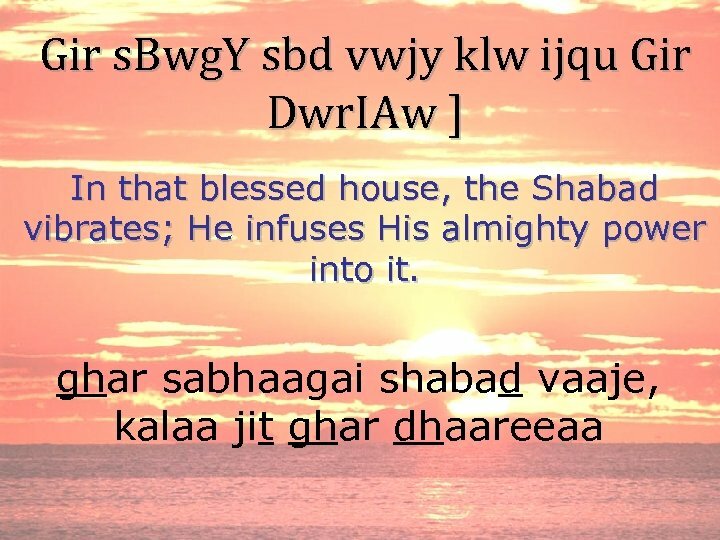 jaa-haa(n) khaalsa jee saahib, taa-haa(n) taahaa(n) rachhi-aa(n) ri-aa-et, degh tegh fateh, birad kee paij, panth kee jeet, siree saahib jee s-haa-e, khaalsa jee ke bol baale, bolo jee vaaheguroo! May the administrative centres, banners, the cantonments of Khalsa ever remain inviolate. 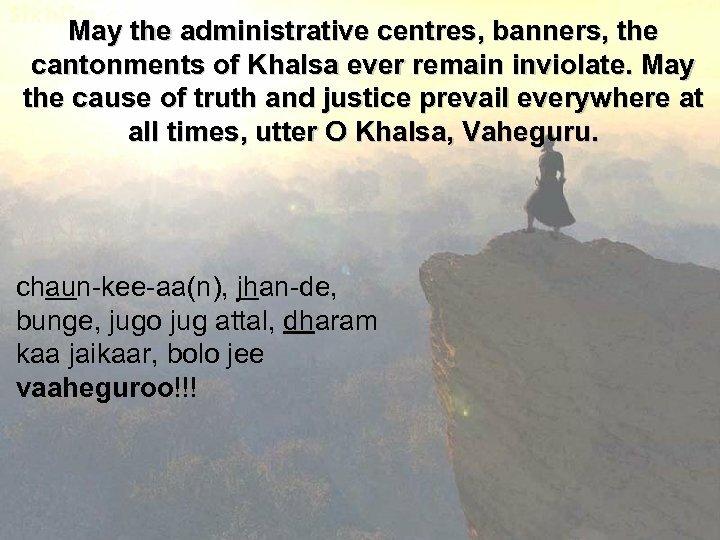 May the cause of truth and justice prevail everywhere at all times, utter O Khalsa, Vaheguru. chaun-kee-aa(n), jhan-de, bunge, jugo jug attal, dharam kaa jaikaar, bolo jee vaaheguroo!!! 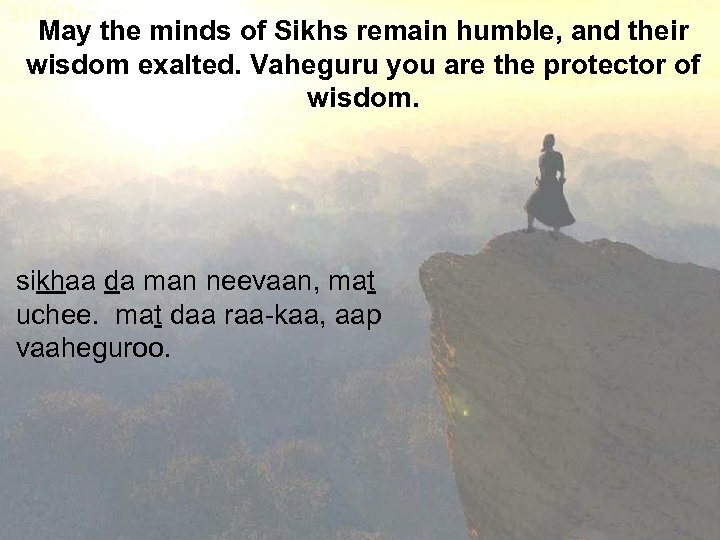 May the minds of Sikhs remain humble, and their wisdom exalted. 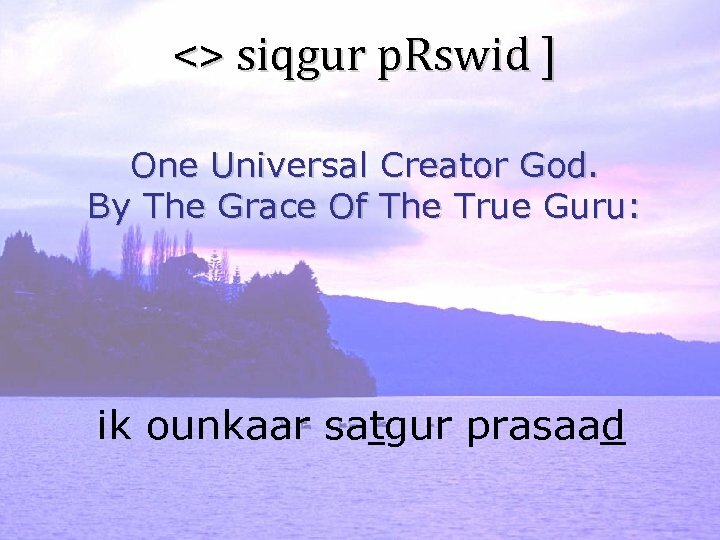 Vaheguru you are the protector of wisdom. sikhaa da man neevaan, mat uchee. 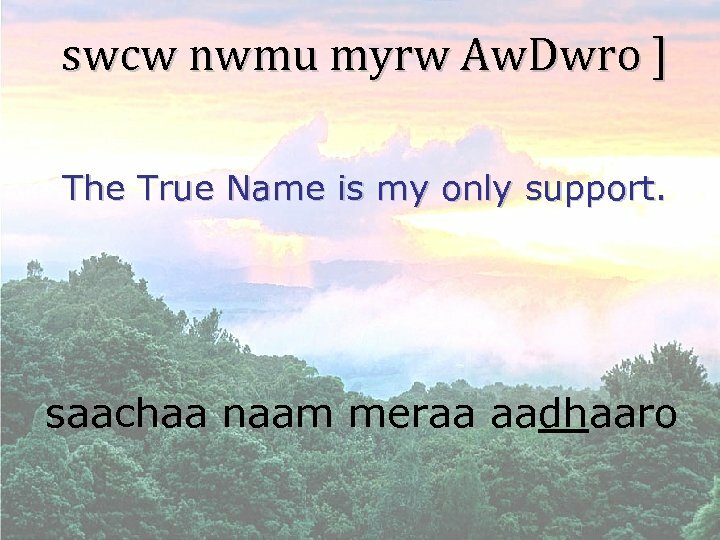 mat daa raa-kaa, aap vaaheguroo. Almighty Lord! 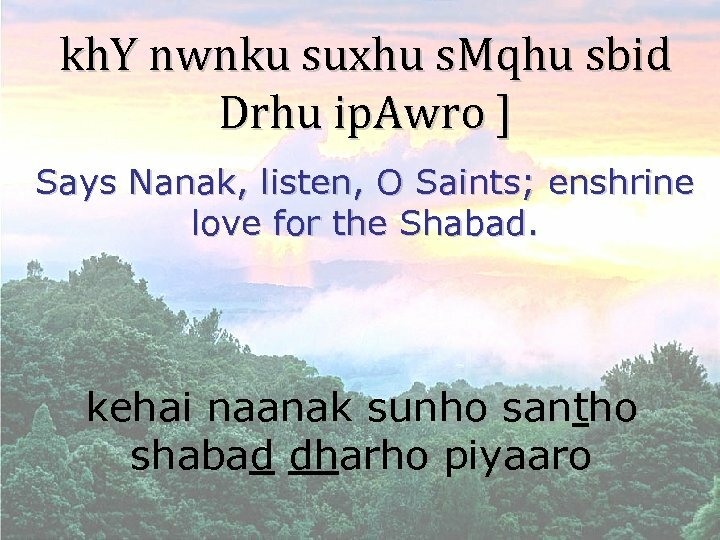 Our helper and protector ever, restore to us the right and privilege of unhindered and free service and access to Nankana Sahib and other centers of Sikh religion from which we have been separated. 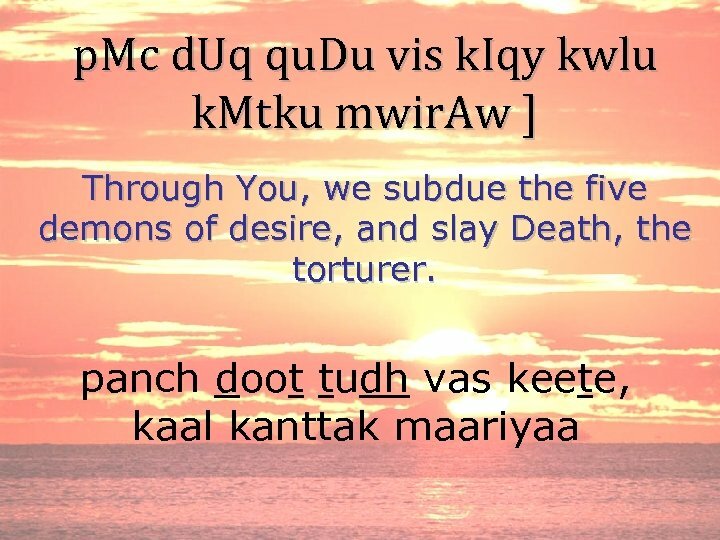 he akaal purkh, apne panth de sadaa s-haa-ee daataar jee-o! 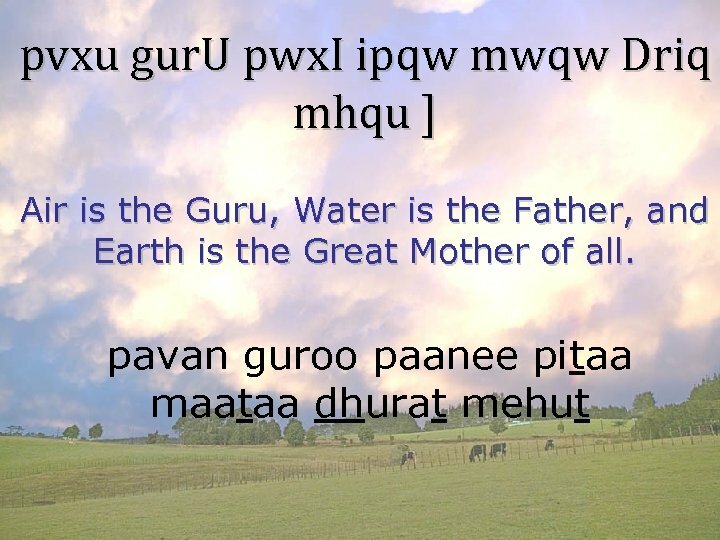 siree nan-kaa-naa saahib te hor gurd-vaari-aan gur-dhaamaan de, jin-haan to panth noo vichhori-aa gi-aa hai, khule darshan didaar, te seva sambaal daan khaalsa jee noo bakhsho. 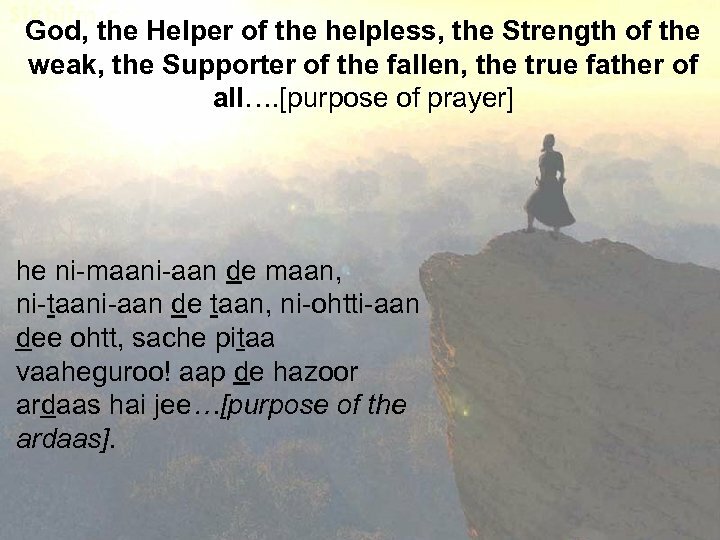 God, the Helper of the helpless, the Strength of the weak, the Supporter of the fallen, the true father of all…. 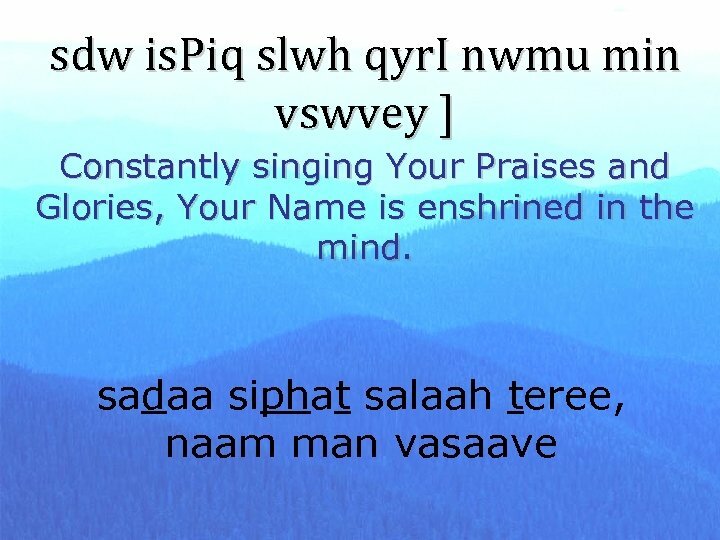 [purpose of prayer] he ni-maani-aan de maan, ni-taani-aan de taan, ni-ohtti-aan dee ohtt, sache pitaa vaaheguroo! 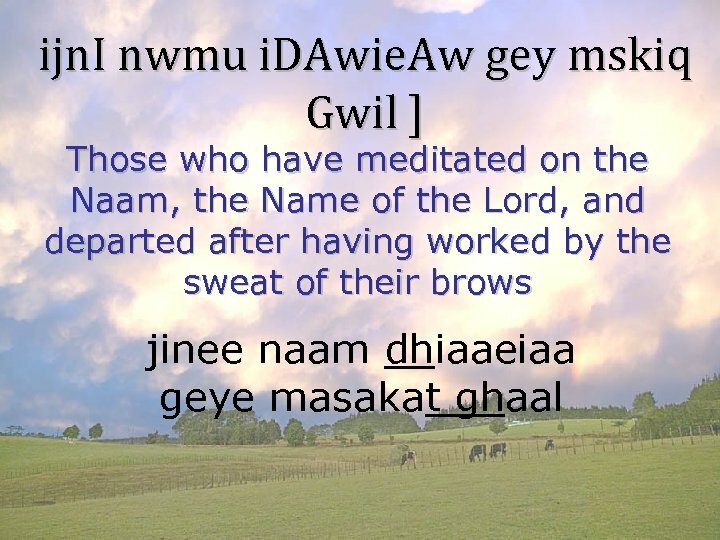 aap de hazoor ardaas hai jee…[purpose of the ardaas]. 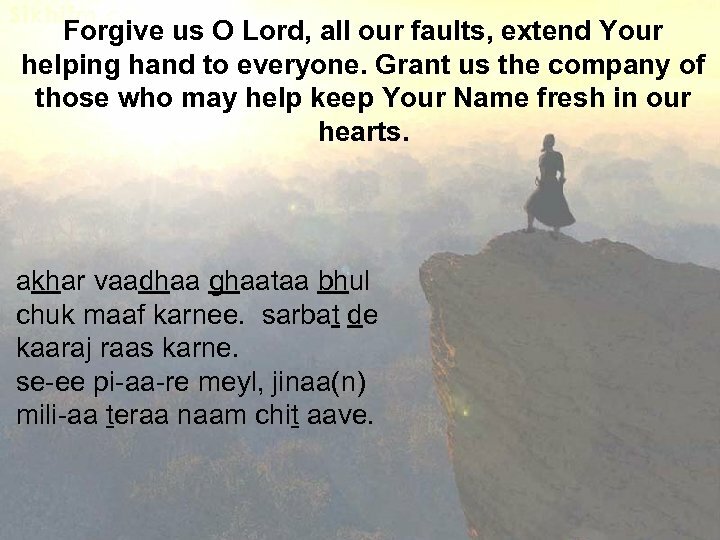 Forgive us O Lord, all our faults, extend Your helping hand to everyone. Grant us the company of those who may help keep Your Name fresh in our hearts. akhar vaadhaa ghaataa bhul chuk maaf karnee. 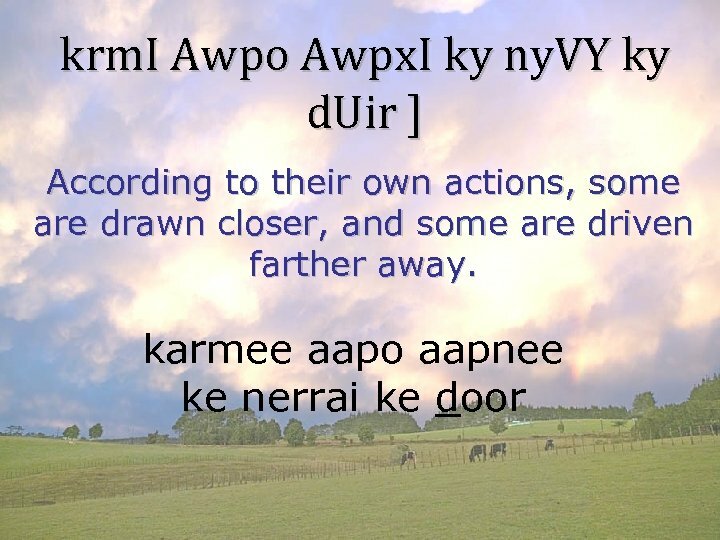 sarbat de kaaraj raas karne. se-ee pi-aa-re meyl, jinaa(n) mili-aa teraa naam chit aave. 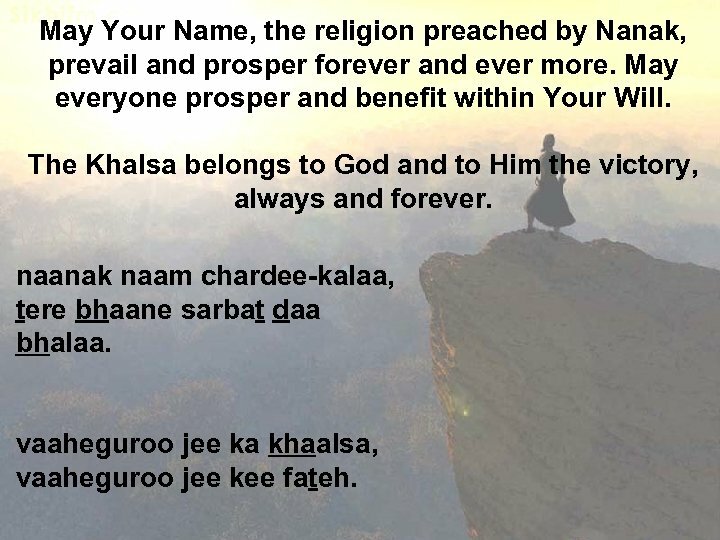 May Your Name, the religion preached by Nanak, prevail and prosper forever and ever more. May everyone prosper and benefit within Your Will. The Khalsa belongs to God and to Him the victory, always and forever. naanak naam chardee-kalaa, tere bhaane sarbat daa bhalaa. vaaheguroo jee ka khaalsa, vaaheguroo jee kee fateh. As was ordained by the Timeless, thus was established the path (Panth). 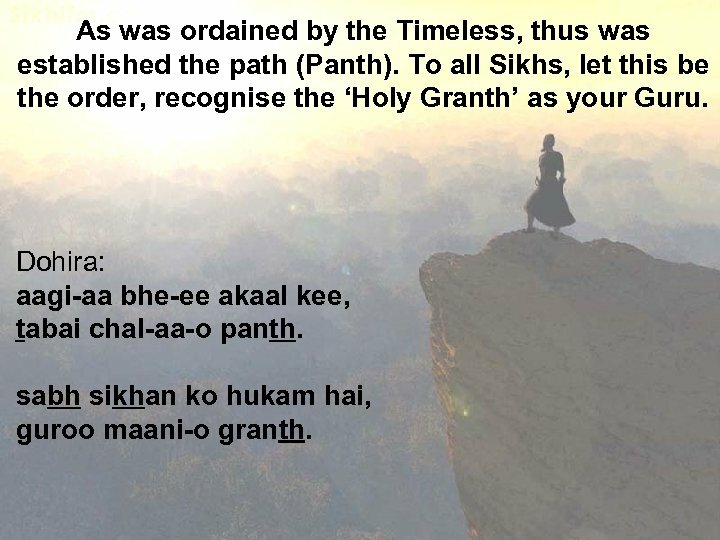 To all Sikhs, let this be the order, recognise the ‘Holy Granth’ as your Guru. Dohira: aagi-aa bhe-ee akaal kee, tabai chal-aa-o panth. sabh sikhan ko hukam hai, guroo maani-o granth. 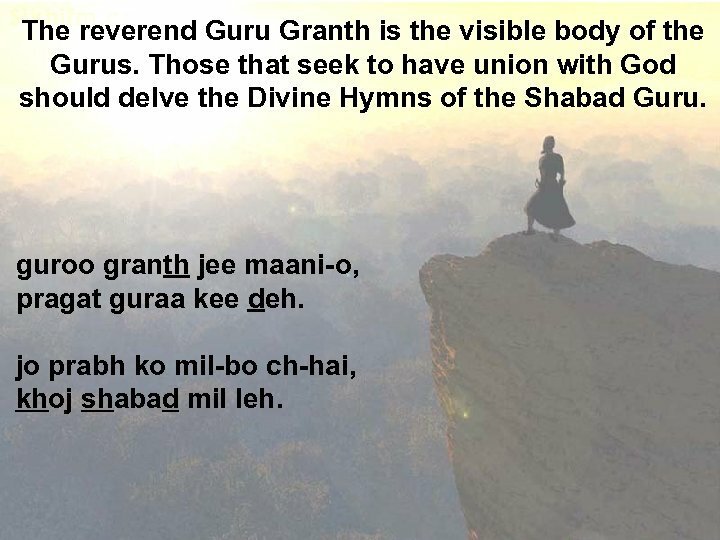 The reverend Guru Granth is the visible body of the Gurus. 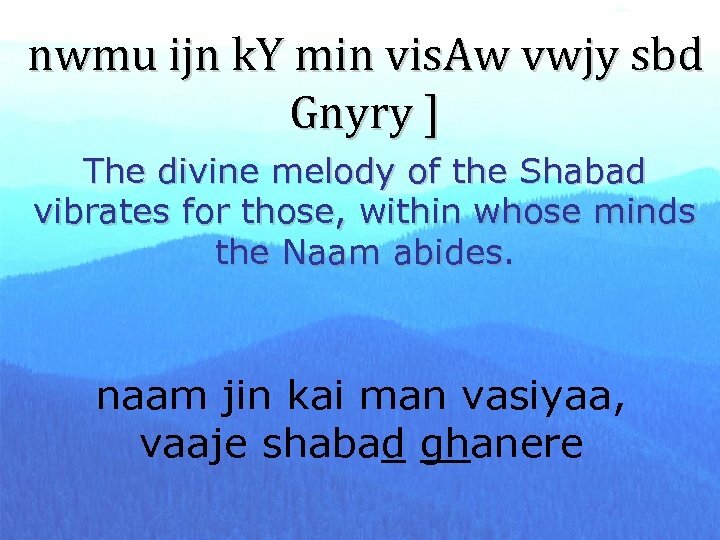 Those that seek to have union with God should delve the Divine Hymns of the Shabad Guru. 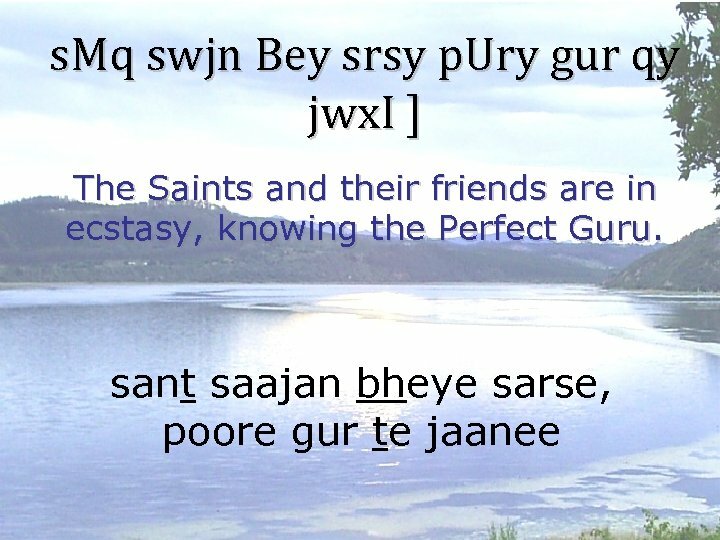 guroo granth jee maani-o, pragat guraa kee deh. 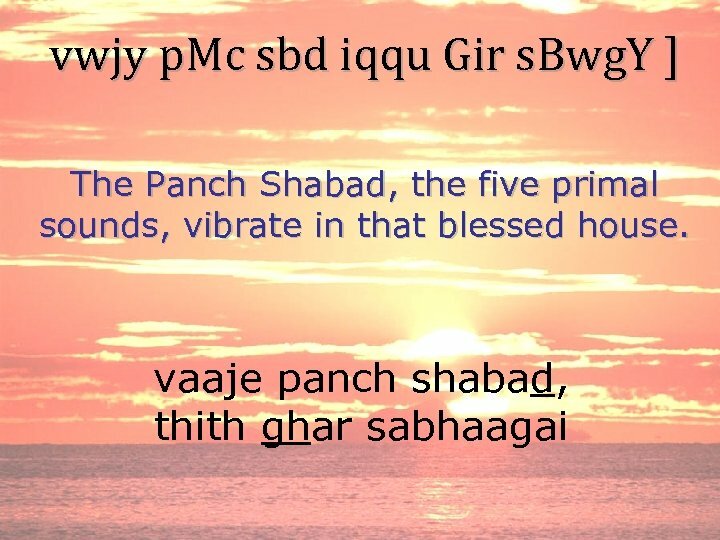 jo prabh ko mil-bo ch-hai, khoj shabad mil leh. The Sikh people shall remain free and sovereign, always, non-challenging this position. 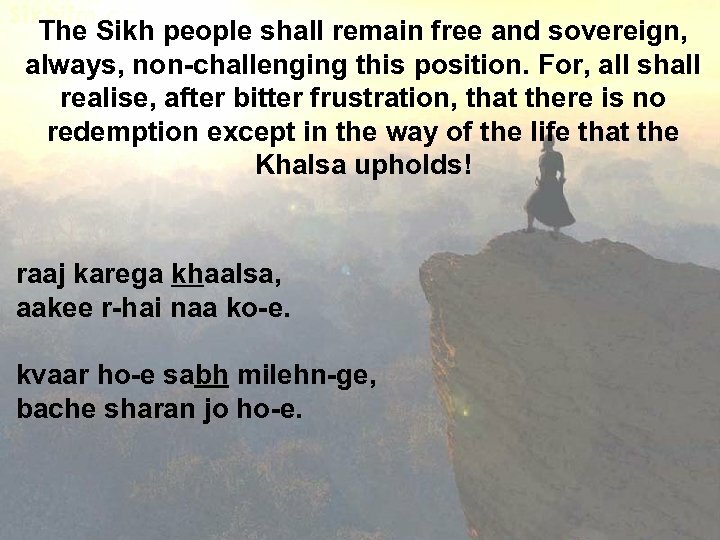 For, all shall realise, after bitter frustration, that there is no redemption except in the way of the life that the Khalsa upholds! 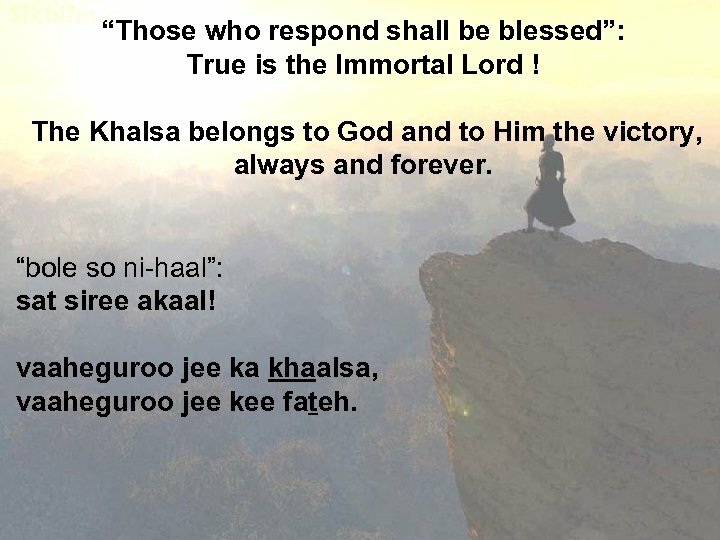 raaj karega khaalsa, aakee r-hai naa ko-e. kvaar ho-e sabh milehn-ge, bache sharan jo ho-e.
“Those who respond shall be blessed”: True is the Immortal Lord ! The Khalsa belongs to God and to Him the victory, always and forever. “bole so ni-haal”: sat siree akaal! vaaheguroo jee ka khaalsa, vaaheguroo jee kee fateh.